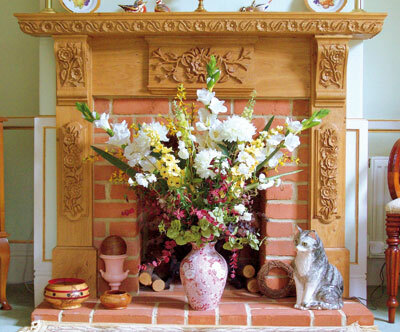 About 25 years ago we lived in a Victorian house where one of the fireplaces had been replaced with a 1950s tiled surround that really jarred with the character of the house. I decided a carved oak mantelpiece would look nicer. There was no prospect of buying one so I set about making one with a very cheap set of tools and an old oak beam. It worked out quite well despite the tools and my complete lack of experience. It was partly finding that I could make things I could never afford to buy, and partly the feel of carving - the twist and turn of your hands and the muscle tension in your shoulders as you push a gouge down and scoop the hollows in a rose petal or shape a leaf. Also I had to do more carving as we moved to an Edwardian house. This time I carved a full oak fireplace based around the same rose and briar pattern I had used before, but taking it much further with elaborate side and centre panels. I finally managed to escape from my office job five years ago so I now have the time to indulge my hobby. I developed a passion for historic buildings many years ago when I joined the National Trust and must have visited most of the stately homes of England, as well as several in Europe and New England. I also grew up around wood. My father was a carpenter and after school I would often go and 'help' him at work. 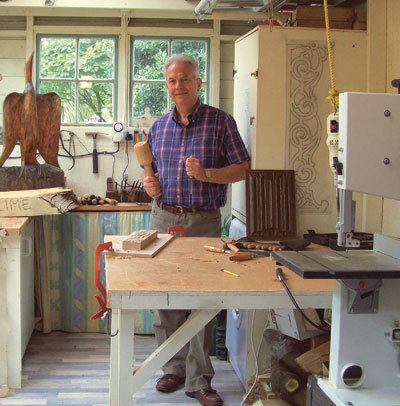 At home he was always making things for the house and I suppose I just grew up with the idea that if you wanted something you just got a piece of wood and made it. As a hobby carver most of my pieces are for my home or family and friends, but at the moment I'm working on a couple of projects for this magazine - one is an Arts & Crafts style oak panel with a simple tulip design; the other is a more complex mahogany shell dish (or tazza) on a stand supported by three gilded 'dolphins' in Louis XVII style. 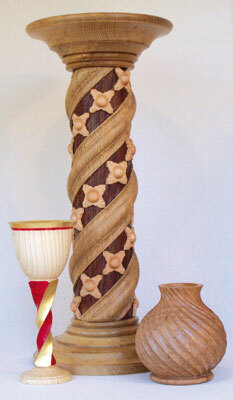 I took up woodturning a couple of years ago so I alternate this with my carving. The two are closely related and I often combine both in one job. The tool most often in my hand is a 10mm (3/8in) No. 3 gouge, which I find very versatile both for removing wood in bulk and carving detail. The next most frequently used is a very sharp and fine 5mm (3/16in) flat chisel which can make a clean cut through anything, even when I need to cut against the grain. 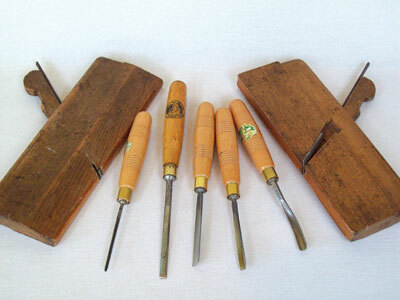 My favourite tools, however, are my traditional wooden moulding planes. My father gave me his and I have added a few from antique shops. Without doubt my preference is for decorative and 'architectural' carving in period styles. This comes from my love of historic buildings, especially their interiors. I try to capture something of their spirit in my carvings, although they have to be adapted in scale for a three-bedroom house! My favourite style is Georgian and I think every carver should visit Buckingham Palace and Windsor Castle to see the magnificence of the gilded interiors. I also greatly admire the Victorians for their willingness to use decorative forms even on terraced houses for ordinary people. It is a little humbling to realise that decoration a modern woodworker would see as challenging would have been all in a day's work to a Victorian carpenter. My oak fireplace is probably still my biggest achievement because of its scale. However, at the time I made it I hadn't progressed beyond the 'rose and briar' pattern I had designed myself because I was comfortable with it. I have since learned to tackle acanthus patterns which are an essential part of period decoration, and also to gild them. Grinling Gibbons - he is to woodcarving what Mozart is to music. He is the yardstick by which other decorative carvers must measure themselves. A W N Pugin is another hero of mine. He was without doubt a genius and it is mainly to him that we owe the wealth of ornamentation in the Victorian period. Among living carvers, I am inspired by Frederick Wilbur. I have learnt a lot from his books and articles, and his guidance has made me a better carver. I would have to do something creative. I have always enjoyed writing and would probably do more of that. I don't think I would go long without picking up a piece of wood and making something, so I would do more woodturning and build more garden structures. My workshop is in our garden. I have a view of a colourful Mediterranean-style herbaceous border with palms backed by a cream-coloured wall. There is a classical Georgian-style covered seat that I made which is a suntrap where I take my coffee breaks. We have a microclimate allowing us to have palms, oleanders and agaves outside all year. I have lived most my life on Mersea Island which is on the East Anglian coast. It is a coastal village with a pretty harbour where we can sit and watch the sun set over the salt marshes. There is only one road on and off the island which floods at high tide, so journeys are planned around the tide table. If I was starting out as a young carver I would love to work for the National Trust. I would probably work for nothing if they just gave me bread and wine and a room to sleep in! I think we all see the faults in our own work - if not, we would never progress. On the other hand I don't try to be a perfectionist. Carving is to be enjoyed and if you could never be happy with what you have made, there would be no point in doing it. "My father was a carpenter and after school I would often go and ‘help’ him at work"